You don’t have to spend a bundle to get beautiful countertops! I’ll show you how to make DIY countertops that look crazy expensive but cost very little in comparison to traditional countertops! These DIY wood countertops are absolutely gorgeous and functional and easier than you think to DIY! This past spring we did a major makeover on our camper. 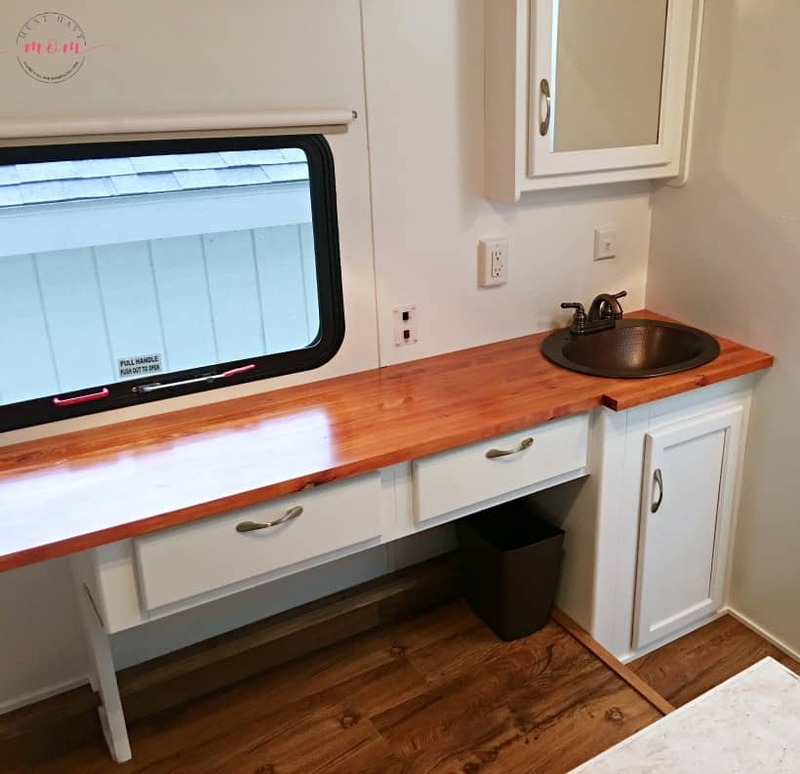 You can see our before and after photos of our modern mountain RV makeover which showcases the DIY wood countertops we made. 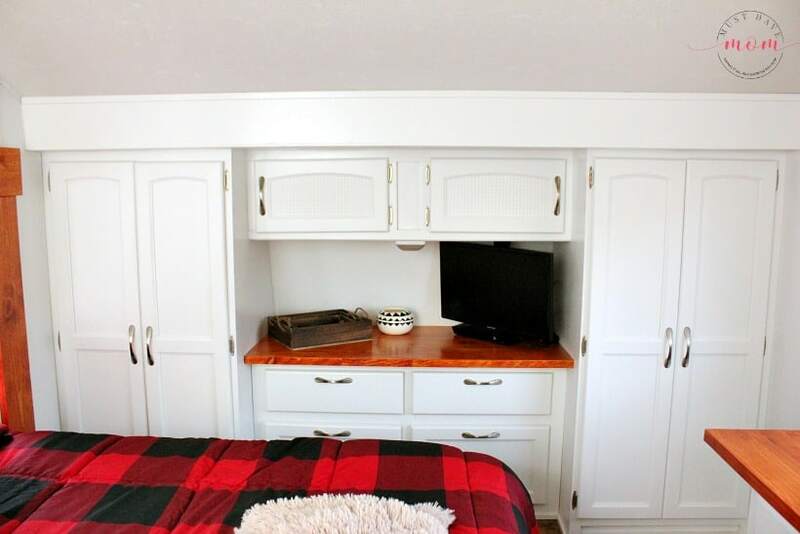 I knew the countertops we had in our fifth wheel were not going to match the modern cozy mountain vibe I was going for but I also knew that I didn’t want to spend hundreds of dollars on new countertops. 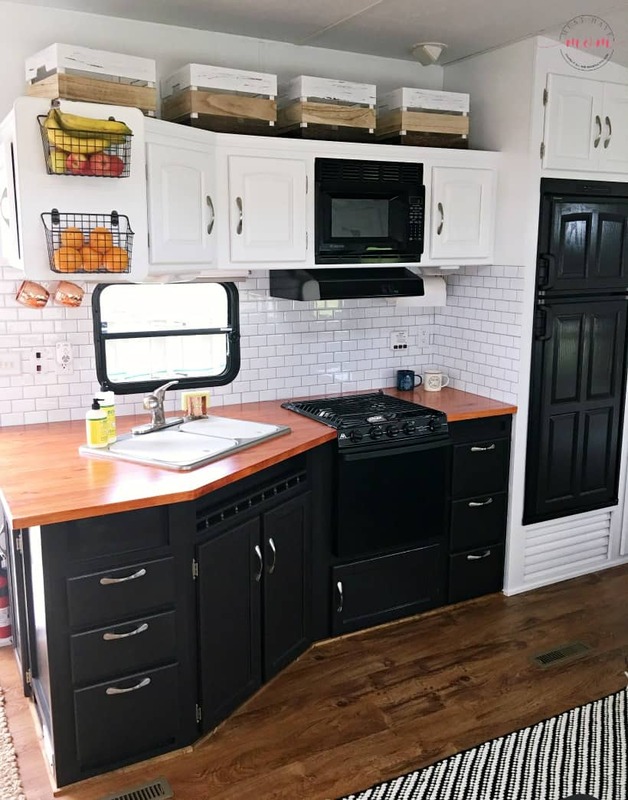 I priced out butcher block counters and was unpleasantly shocked at the cost that replacing all of our camper’s countertops would be. 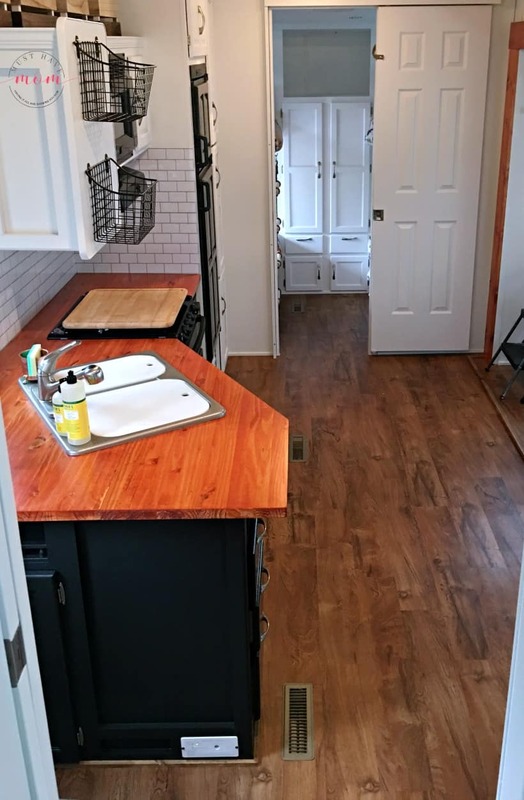 We had a countertop in the kitchen, bathroom sink area and master bedroom to replace so I knew I needed a budget-friendly option that didn’t include formica! My end cost for all three countertops was around $100 total! 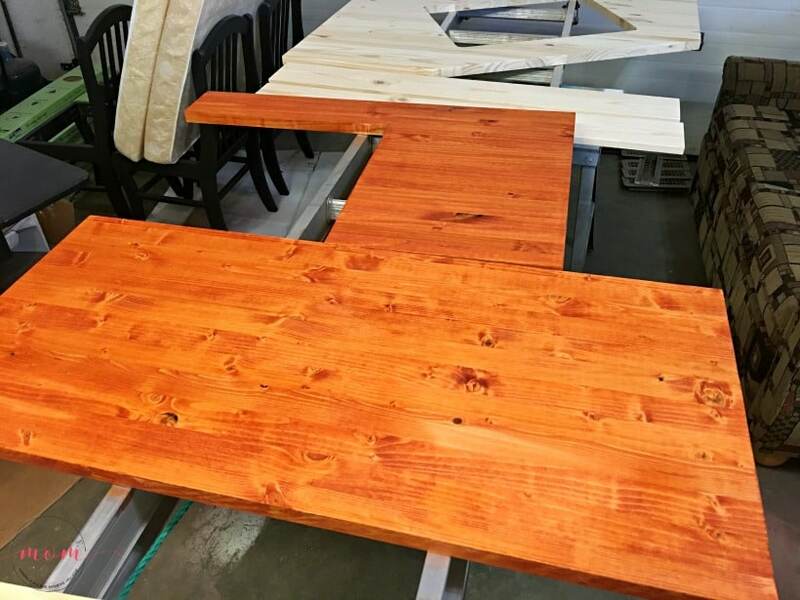 I scoured the internet in search of a solution and found everything from people using wood flooring for countertops to reclaimed barn wood. I didn’t have access to reclaimed barn wood and I knew I didn’t want to putz around with flooring on a countertop so I set out to create my own DIY wood countertops and the end result was so much more than I even hoped for! They are gorgeous, look high-end and they are durable too! I couldn’t ask for more. 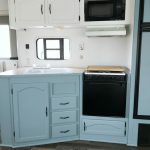 If you are looking to get rid of the ugly countertops in your camper but aren’t sure how to DIY your own countertops then look no further because I will show you how I did it and I am willing to bet it is easier than you think! These DIY wood countertops are inexpensive, relatively easy and I’ve found them to be more durable than butcher block (and far less expensive). You’ll need a few materials to get started and some basic tools. 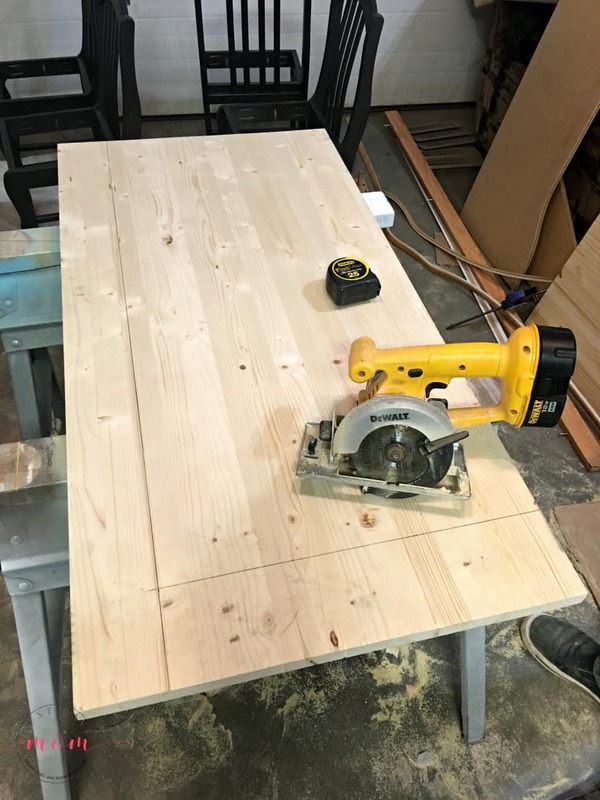 To make these DIY wood countertops we used inexpensive edge glued pine which you can find at most Home Improvement stores (Menards, Lowe’s, etc). I used the one pictured above. Be sure to measure each of your countertops so you can calculate how big or small of a piece you will need. 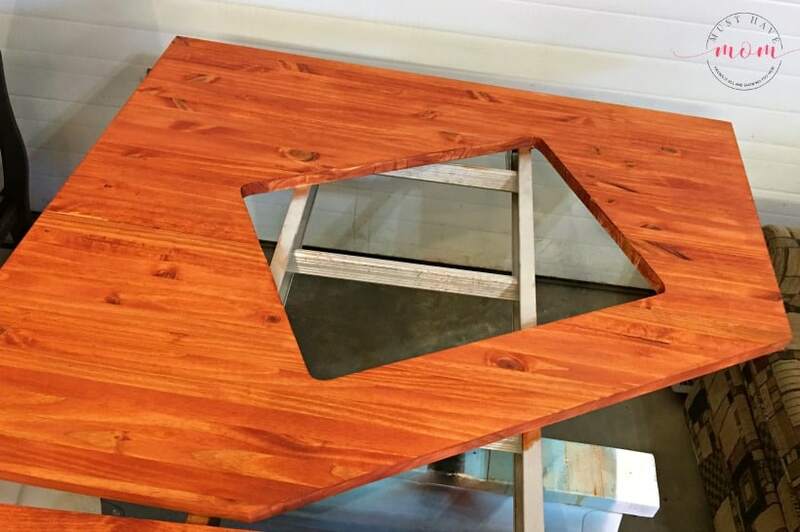 For our large kitchen countertop, I used three pieces and glued two of them together. You can get various lengths, just make sure they are the same thickness. When you select the boards be sure to choose boards that are straight and not warped at all. Also, check them for knicks or damage. You’ll also need a wood stain in the color of your choosing. 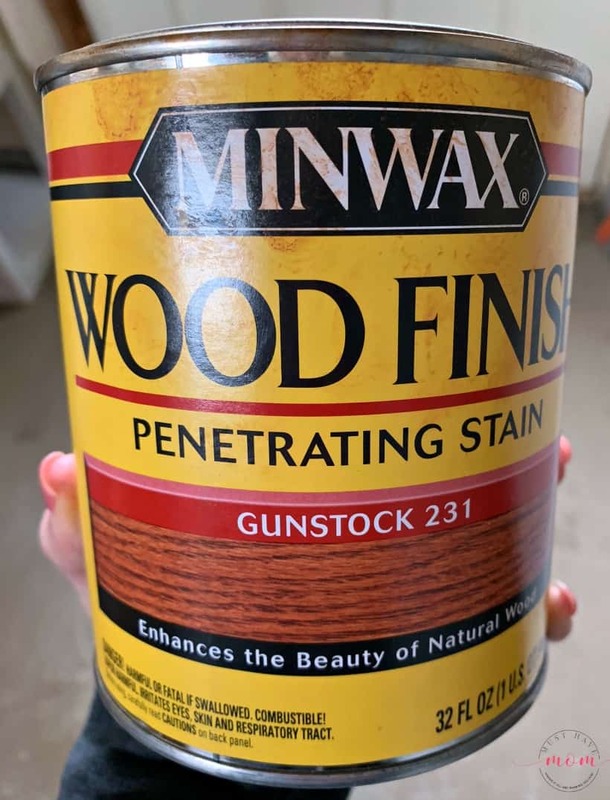 I used this stain in Gunstock on my countertops. You’ll also need a sealer for the countertops. I used a waterproof polyurethane sealer on mine. 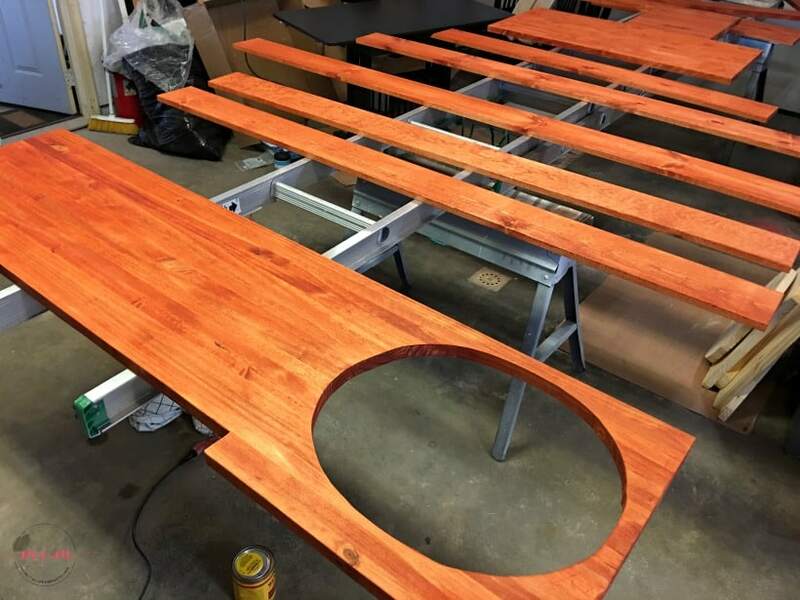 Grab some rags to apply the stain and a paintbrush for the poly. First, you’ll need to determine how you’d like your countertops to look. We opted to make ours slightly different from the RV countertops that were originally installed in our camper. I didn’t love the rounded edges on our existing countertops and knew I wanted more square counters that would utilize the space better and provide more counter space. I’ll show you what I mean. Our kitchen countertop had this rounded edge that came jutting out but didn’t provide much counter space for prepping food. There was very little usable space on our countertops. By configuring the new countertops to come out a little further and have a square end we were able to gain a lot more usable counter space. We also brought the countertop out a little further in front of the sink to give some space. I love this new configuration and it has given me a noticeable increase in counter space. In the master bedroom, our countertops had a spot that rounded outward to provide room for the TV. I didn’t love the look of it at all. We opted to instead have the countertops come out the same distance as the rounded out portion on the existing countertops and kept them straight across. We gained counter space the whole way across which is really useful when I’m working and need room to spread out papers. It looks much prettier too! Finally, our bathroom countertop was also rounded on the end. I didn’t like the rounded look and you’ll also notice that in front of the sink it is straight across. When we made the new bathroom countertops we opted to square the end of the countertop which provided more counter space without impeding access to the closet. 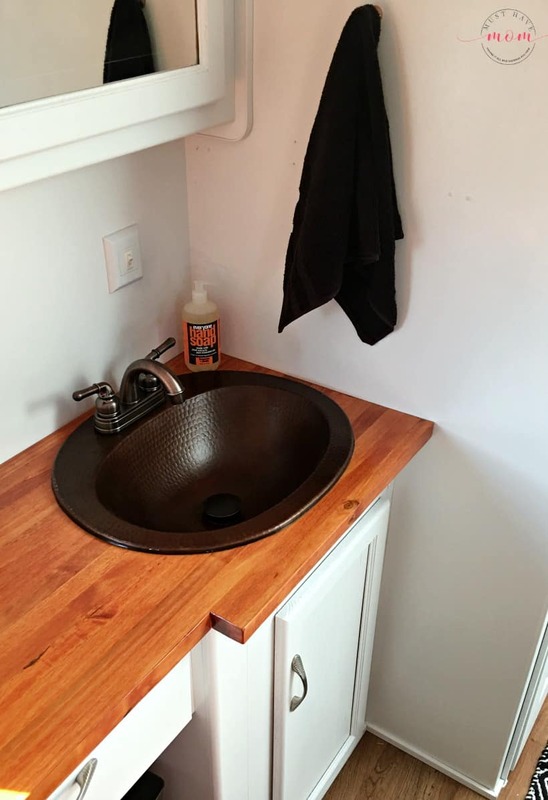 We also had the countertop jut out in front of the sink which allowed us to use a bigger sink than the one that was there (this is a standard copper bathroom sink with an RV faucet in bronze) and still have a little room in front of the sink to look aesthetically pleasing. 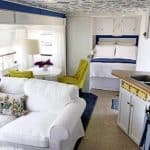 As you can see, doing an RV makeover is about more than just making it look better. It is also about making it more functional and making it work for your needs. By stopping to think about these minor adjustments in shape and size of the countertops you’ll gain more counter space and increase the functionality of your small space. These are the little details that make a big difference in the end result! Once you have settled on measurements and shape for your countertops, it is time to cut them out. I recommend creating a cardboard template and trying that out in your space to ensure it works how you want. We tried out our template for the modifications we were making and we had to tweak it slightly to make sure it worked for walking space and working space on the counters. Measure twice, cut once! 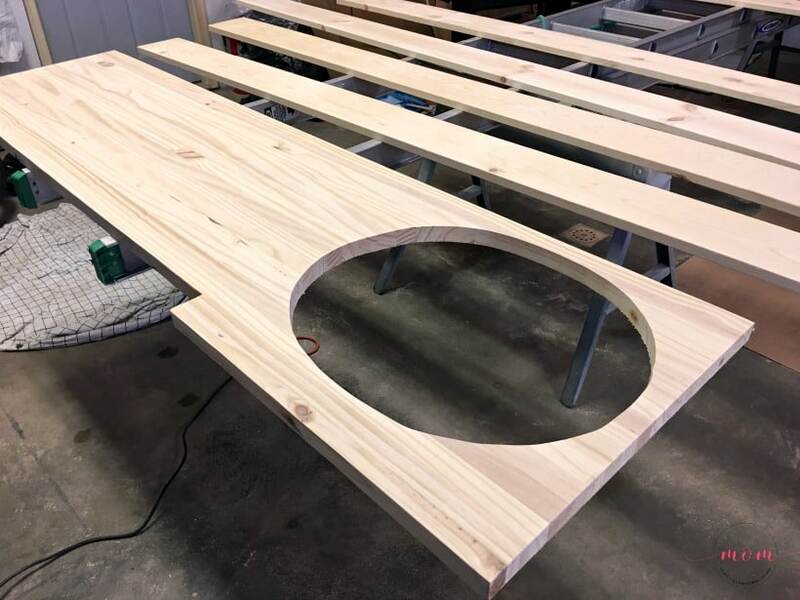 For our kitchen countertop, I couldn’t find a large enough piece of glued together pine to create the wide counter I needed so I took two smaller pieces and glued them together with wood glue. Clamp them together and allow to dry overnight before cutting the sink hole. We used a circular saw and a jigsaw to cut the countertops out. You’ll also need to cut a hole for the kitchen and/or bathroom sinks. Measure the sink and if you are replacing your sink be sure to cut the hole to the proper measurements for that sink. 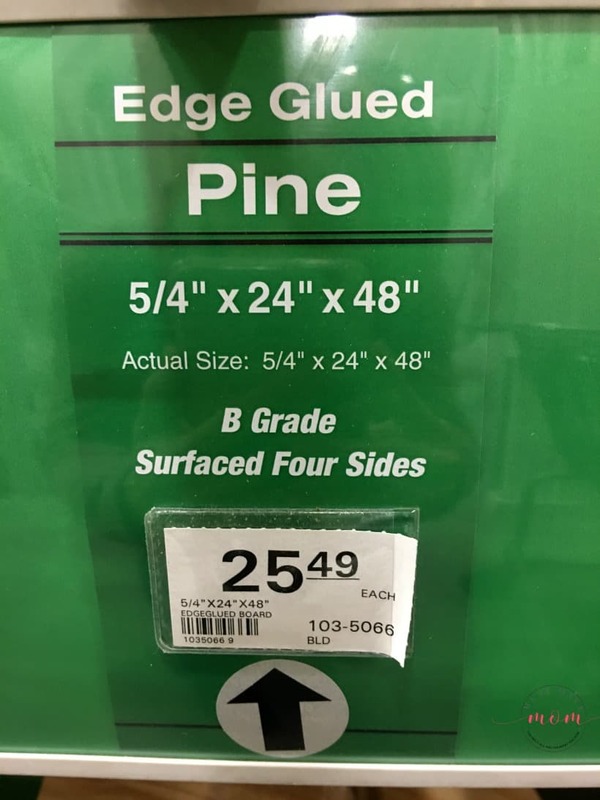 New sinks often come with a template to help you cut out the hole in the countertops. Use it! We used our existing kitchen sink so we traced the hole from the previous countertops onto the new countertops. For the bathroom sink, we replaced that with a standard copper bathroom sink so we had to tweak that one a little bit to ensure it was positioned properly above the open cabinet underneath and that it lined up correctly. Be sure before you cut that it will fit properly! Remove the old countertops (save the screws if they are in good condition or save one to buy replacements with). Before removing the countertops you should remove the sink and stove. I’ll have a tutorial coming soon on removing the stove if you aren’t comfortable with this. Be sure to shut off the gas line first! 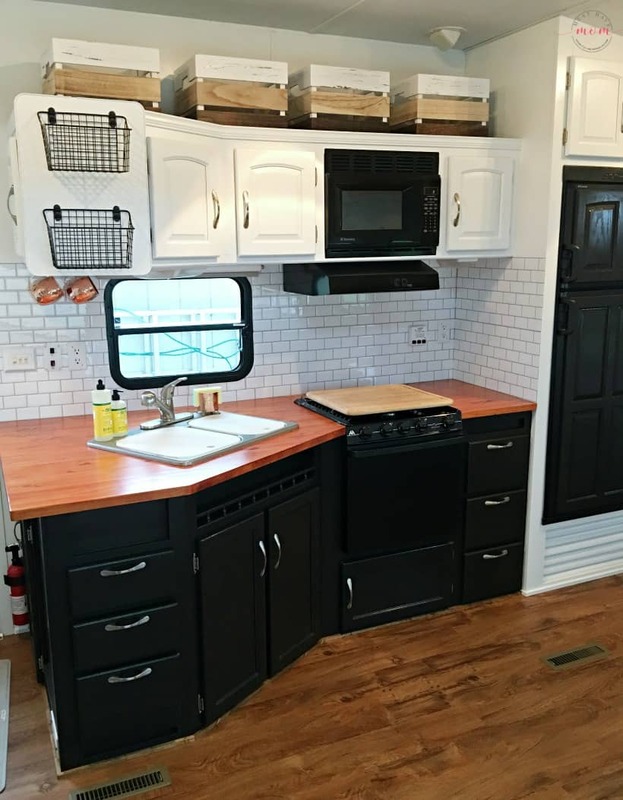 After you’ve removed them, this is a great time to paint the cabinets! We went with black for the lowers and white for the uppers. 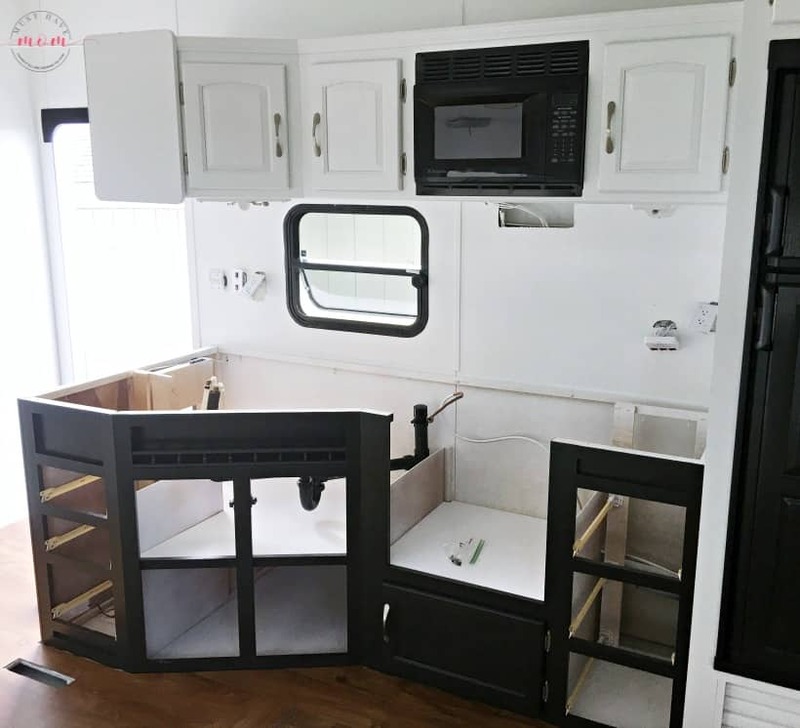 Once you have cut out all of the countertop pieces make sure to bring them into the camper or your home kitchen and fit them onto the top of the cabinets and ensure everything fits properly. You need to make sure that all of your final cuts are made and tweaked before sanding and staining the countertops. Once you are satisfied that they will work it is time to sand and stain them! Use 220 grit sandpaper to sand the tops and edges of all the countertops. Be sure that all rough edges are sanded down. I used an electric handheld sander for this because it’s fast and I hate sanding! Once you are satisfied with how smooth they are, take a rag and wipe them down good to get all the dust off. Then apply a coat of stain using a rag. Wipe on a section at a time and then wipe off the excess stain. Be sure to read the directions on the can of stain and follow them. I like using a rag instead of a brush because I find it to be easier and I like the look of the stain that it gives versus using a brush. You can do whichever you prefer though! If you have any areas that will overhang the cupboards be sure to also stain the underside of the countertop in that area because you will see it if you are sitting on the floor and you don’t want the raw wood exposed. I made the mistake of forgetting to do this and had to go back and stain it after. Once you have followed the directions on your stain can for drying time, you can move on to applying the polyurethane sealer to them. I used Helmsman spar urethane indoor/outdoor clear satin to seal mine. This can cause yellowing over time so if you are concerned about that then choose a water-based poly sealer instead. Since my countertops have an orange hue I didn’t mind taking the risk of it yellowing. Continue applying layers of poly until you are satisfied with the finish. I applied 3-5 layers of poly to my countertops. 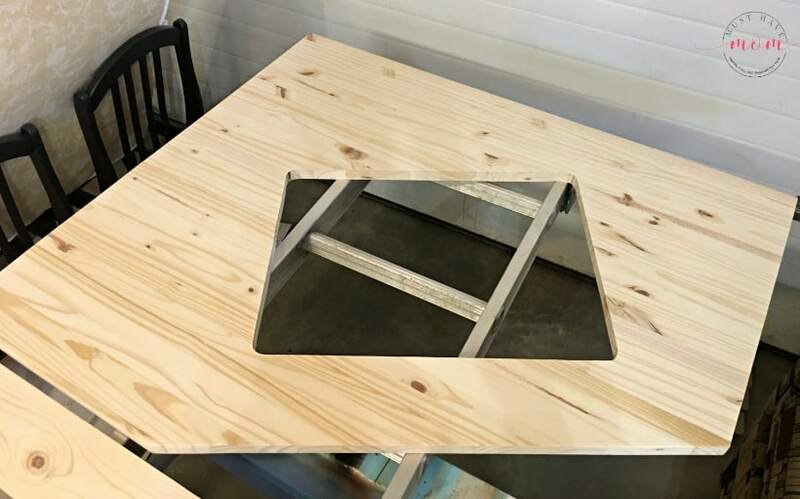 Be sure to get all the edges as well as inside the sink cutout. You want to seal them well to keep water out. Once your poly finish has dried completely, you can install your beautiful new DIY wood countertops! This is the best part!! Place them on top of the cabinets and secure them with the screws that held the old countertop or replace those screws if needed. At this point we stopped and installed our peel and stick subway tile backsplash. We did this before installing the stove because it was easier to access the backsplash area with the stove removed. 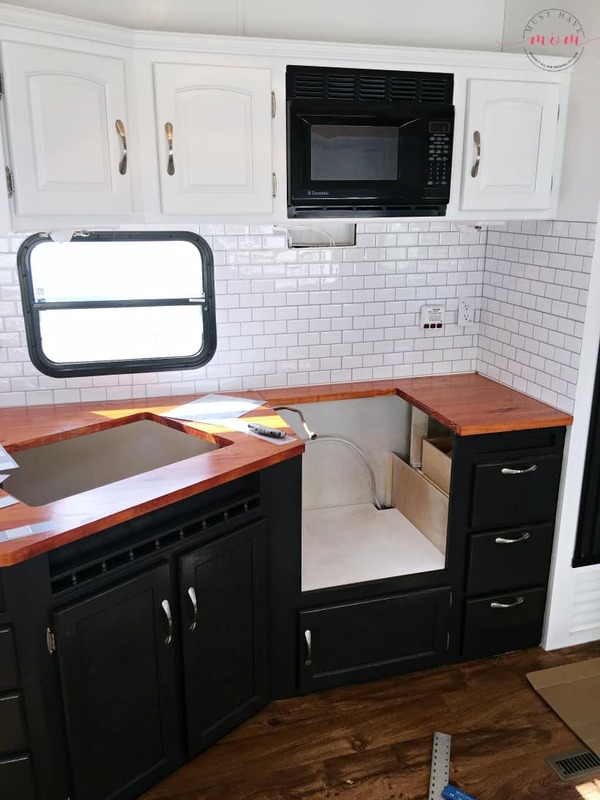 Another reason we installed the backsplash at this point was because in an RV everything is not square. We knew that we may need to shim the countertop up to make the subway tile line straight on the bottom. 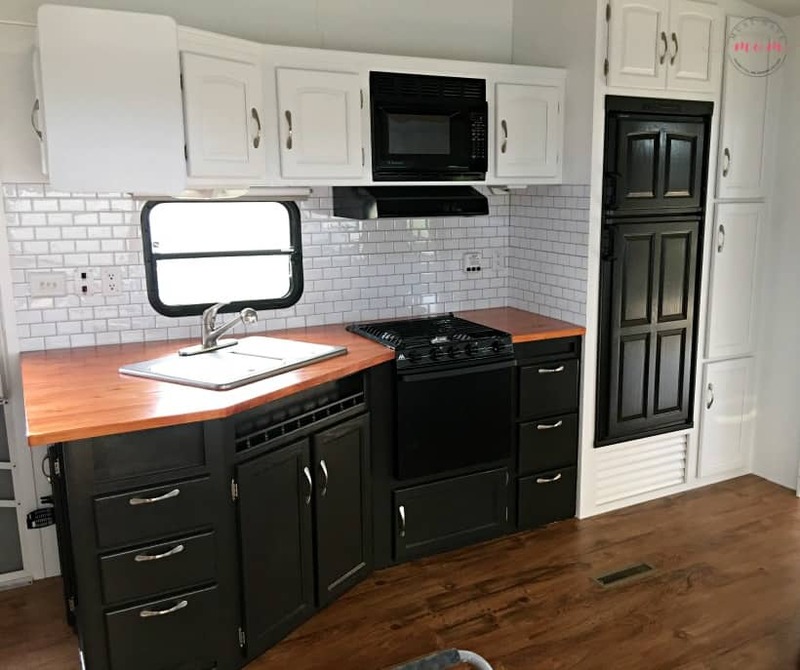 We chose to use peel and stick subway tile over traditional tile because an RV is made to move down the road and traditional tile is heavy and not flexible which may lead to cracking and weight problems. 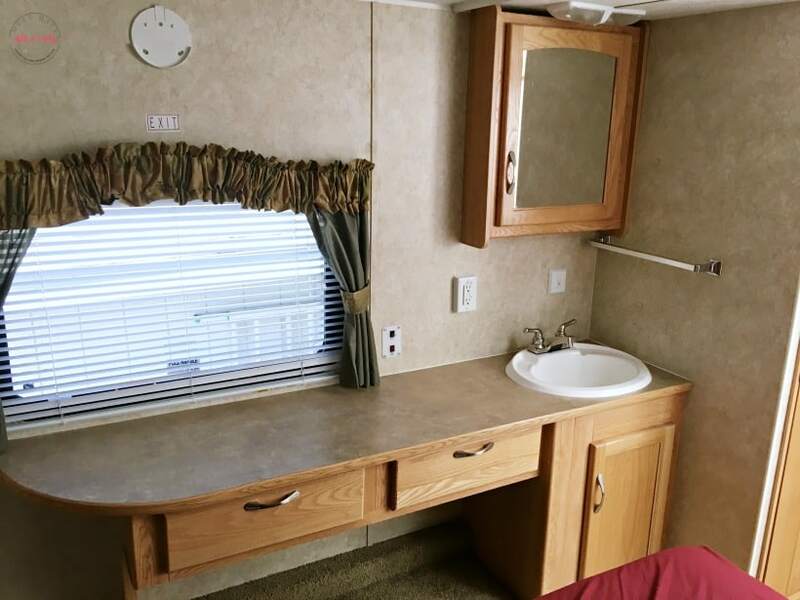 The peel and stick tile is lightweight and flexible which is needed in an RV. After installing the subway tile we did indeed need to shim the countertop up a bit. Be sure to also use a level to ensure the countertops are somewhat level. 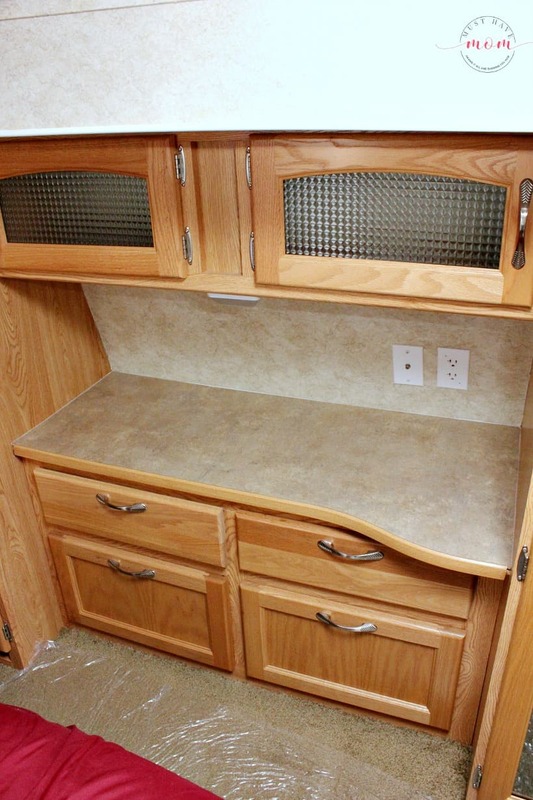 Keep in mind that your camper needs to be level in order for your level on the countertop to be correct. 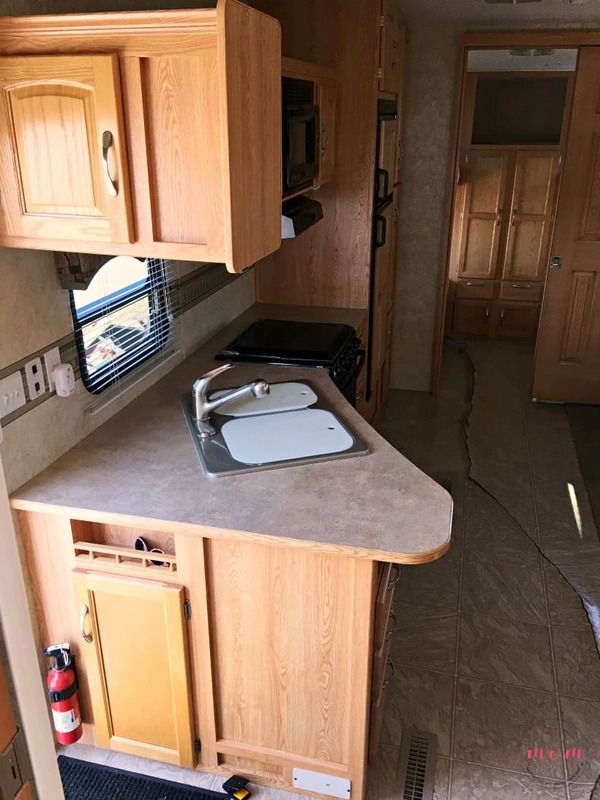 Check the level on the floor to determine how level the camper is and reference that when checking the countertops. Now comes the time to install the sink and stove and finish your project! Yay! Be sure to hook up the plumbing and stove lines properly. Run a bead of caulk around the sink to seal it as well. We used clear caulk for this. Now that your gorgeous countertops are finished it’s time to add the finishing touches that take it to the next level. 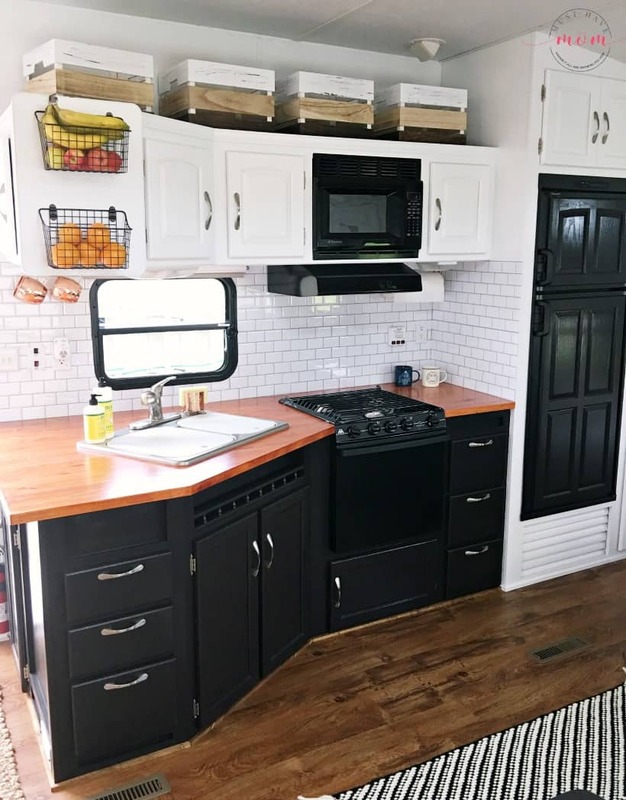 If you’ve done the subway tile as we did then you’ll agree that it adds a whole new level of awesomeness to your RV kitchen! Add some pretty soap to the sink and a pretty copper sponge holder. Some mug hooks under the cabinets with some copper moscow mule mugs added to them adds in another material to your design and makes the countertops really pop. Fruit baskets added to the upper cabinets gave us additional storage space and looks pretty too! We replaced the old window covering with a simple roller blind that is understated but functional. I added wood baskets above the upper cabinets as well to make good use of the dead space that was there. I store light items like chips and bread, that would otherwise be crushed in the cupboards, in these baskets. 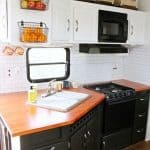 The whole RV kitchen has been transformed by the addition of these beautiful DIY wood countertops. The space is more functional and it has held up beautifully for an entire camping season already. These DIY wood countertops are very durable and require very little care. Keep them as dry as possible by wiping up spills as they happen. Use warm soapy water to clean them. That’s it! Avoid setting any hot pans on them and be sure to use hot pads if you do. Do not cut directly on the countertop as you’ll create cuts in the poly finish. Always use a cutting board. I use this stove top cutting board because it adds even more counter space to the area when I’m not using the stove and doubles as a cutting board. I hope you found this tutorial very helpful for making your own DIY wood countertops! Have questions that I didn’t answer here? Leave them in the comments and I’ll do my best to help you! Want more fun camping tips? Join our camping group on Facebook! Don’t miss my free RV packing list printable either! 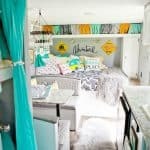 Requesting it will also get you on my RV email list so you won’t miss out on future DIY camper makeover posts! Get The Free RV Packing List! Send my free RV packing checklist and get access to the entire library of free camping printables! Your free RV packing list will arrive in your inbox shortly. Add sarah@musthavemom.com to your address list to ensure it doesn’t land in your spam folder. Easy RV Remodeling Instructions + RV Makeover REVEAL!